This entry was posted in pastoral ministry, quotes, William Still and tagged pastoral ministry, quotes, William Still by Brian Cochran. Bookmark the permalink. That sounds like a good book to read. Good on Mr. Still for even writing that! It was a good book! 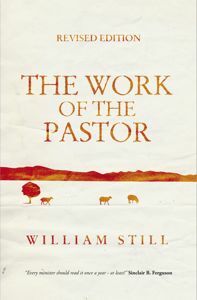 The late William Still was the pastor of Sinclair Ferguson (http://www.firstprescolumbia.org/590684), whose preaching and writing I have come to really appreciate. So, being a young pastor myself, I thought I would see what his former pastor had to say in this book. I had heard nothing but good things about it and I really enjoyed reading it. It isn’t a precise theological work but rather reads more like a sermon from one pastor to another. I wish that more ministers would take this advise and run with it. And having come out of broad evangelicalism myself it is disheartening to be aware of how accurate that diagnosis of the “modern” or “relevant” minister and church is and the fact that I still no many people who truly desire to serve the Lord who are fill with this sort of “claptrap” as useful or even fundamental to ministry. @ Adam. . .thanks for commenting. . .and yes, it’s truly sad. . .I come out of this background myself and find it disheartening that so many are caught up in an entertainment driven church rather than a means of grace, gospel driven, Christ-centered church where the Word of God is faithfully preached and God is worshipped with a biblical balance of reverence and awe for God’s holiness and with confidence, joy and thanksgiving for what Christ has done for us (Heb. 10:19-25; 12:28-29).